The first thing that must be acknowledged about Rattner’s keynote is that it represents a symbolic endorsement of the singularity from a major player in the technology industry. 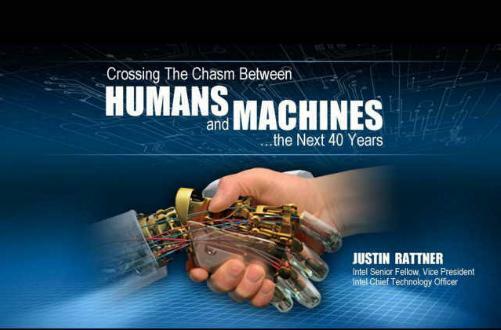 Believers in the singularity are sometimes seen as crazy or over optimistic, but with Rattner’s keynote it is clear that the idea of a singularity occurring in this century is gaining serious momentum. In this segment Rattner discusses with Dr. Garner how the industry will be able to continue the doubling of computing capacity every year as it has done for the last 40 years. With current technology at the 32 nanometer scale, we are fast approaching limits on how small we can get with current semiconductor technology. Dr. Garner suggests a number of technologies and ideas for overcoming this hurdle (trigate transistors, quantum computing, carbon nanotubes, etc. ), but in our opinion none of these ideas are new and no new light is shed on how and when any of these technologies will become a reality. Brian discusses a collaboration between Intel and UCSB to combine the speed and bandwidth offered by light (photonics) with the versatility and mass production capabilities of silicon. This marriage between silicon and photonics could offer a host of new capabilities and advantages in the future including huge bandwidth, decreased cost, and decreased energy consumption. Intel has a pretty good website dedicated to this entire technology here. Dr. Rabaey predicts that we will have 1000 radios per person in 10 years! This was the most interesting idea offered during Dr. Rabaey’s presentation and is definitely an exciting vision of what the future may hold. Dr. Rabaey stated that the three major problems with a massively wireless world are limited radio spectrum, limited energy for radio devices, and too many standards. Dr. Rabaey offers intresting ideas for overcoming these problems, but from our view this is simply a focus on improving the efficiency and the intelligence of how radios communicate. What we fail to see in this presentation is any revolutionary technology or capability for the future. Wireless power transmission technology debuted about a year or so ago, but nonetheless it is a stunning concept and the demo was great to see. Alanson was able to send 60W of energy wirelessly across a distance of two feet to power up a light bulb. Approximately 25% of the energy is lost during transmission, which is pretty good (Alanson claims this is more efficient than many wall warts)! From the standpoint of the singularity one of the more interesting applications of this technology would be the ability to recharge or power up devices that have been implanted into the human body. Jordan Robertson from the Associated Press in a recent article gives us more in depth information about the technology, and reveals that 90% efficiency of power transmission has actually been achieved at a distance of 3 feet. David and Sidd demonstrate a robot named Herb that can enter an environment and autonomously find, navigate to, and then pickup any coffee cups in the vicinity. Many people underestimate the difficulty in such a task, but in truth it is actually quite difficult for robots to replicate the human ability to navigate a new and unknown environment that is also changing as people and other objects within it move. Herb did a commendable job of performing his task, but overall this demonstration is similar to many other projects occurring all over the world, most notably the DARPA Urban Challenge which is referenced during the presentation. Our Take: Now This is Revolutionary! Josh presents to us something completely novel, a sixth sense called pretouch in which a robot uses electric fields to sense its environment. The inspiration for this technology comes from certain species of fish that have this same capability. In the demonstration a robotic hand was able to use pretouch to create a 3 dimensional spatial model of an apple that it was presented with. The robotic hand was then able to grab the apple based upon this dynamically generated model. The entire task was performed without the aid of cameras (for vision) or any other conventional senses. MIT Technology Review wrote an article about pretouch nearly a year ago and it is a good place to start if you want to learn more. Pretouch gives us a glimpse of a future in which humans and robots will have capabilities that are completely different and novel from those that we have today. Emotiv demonstrates one of the most practical and well developed noninvasive neural interface applications we have seen. In the demonstration a human plays a game in which he is able to scare creatures away, change colors of the game, and even move objects (though with noticeable difficulty) simply by thinking alone. The gamer is wearing a helmet that detects electric field fluctuations emanating from his skull and these fluctuations are translated into actions within the game. Emotiv shows us a really cool possibility for enhancing gaming interfaces and a compelling pathway to many other novel applications. Despite this, we are only marginally excited about this technology because noninvasive neural interfacing is a poor substitute for the capabilities offered by truly invasive, direct neural interfacing. Noninvasive neural interfacing is error prone and limited in its ability to extract human intention. Lets go straight to the source and focus on direct neural interfaces into the brain…that is where the true link to human intention will be revealed. Jason Campbell presents an Intel initiative to build shape shifting materials composed of building blocks called catoms. Intel’s latest catom prototypes are currently 1/10 of millimeter in diameter nanobots with their own microprocessors and actuators that are capable of changing their color and other properties. Jason presents us with the vision of a matchbox sized cell phone composed of thousands or even millions of catoms that can morph on demand into a nearly full sized keyboard. Catom based shape shifting technology is still in the very early research phase and there does not seem to be any real world example of this technology to date. Nonetheless, it was fascinating to see real progress being made in a technology that has captured the imagination of science fiction writers for decades.